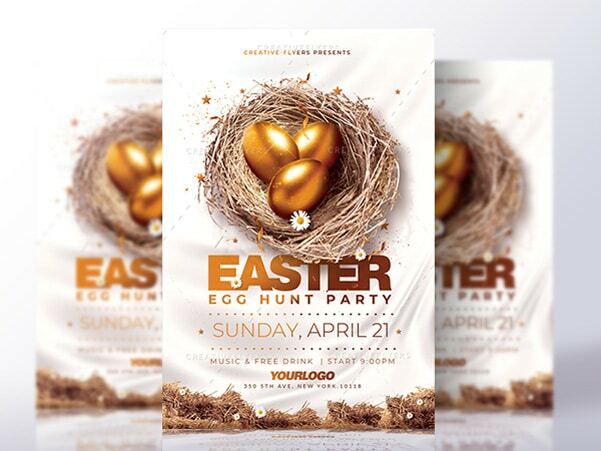 Creative flyer template to promote your Easter party ! 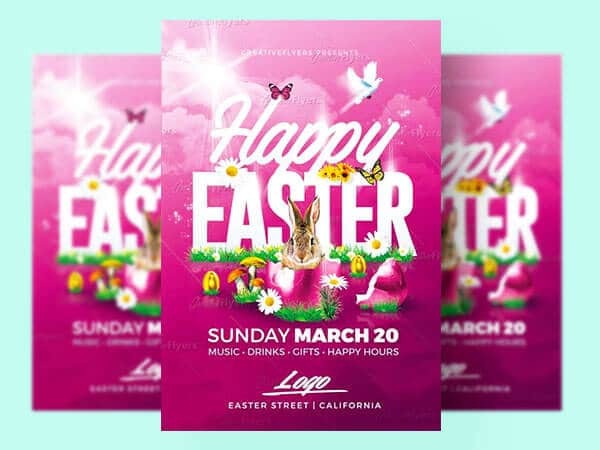 Easter Flyer Psd editable with Photoshop. ✪ 100% Recommend this Template. 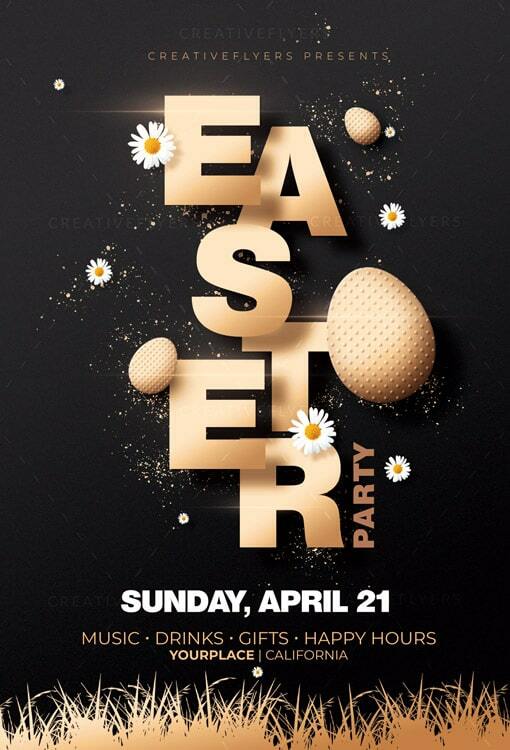 A special time to promote your Easter party, with this flyer / poster save time and create a personalized design with your own text, images and colors if you wish, all elemants are editable. 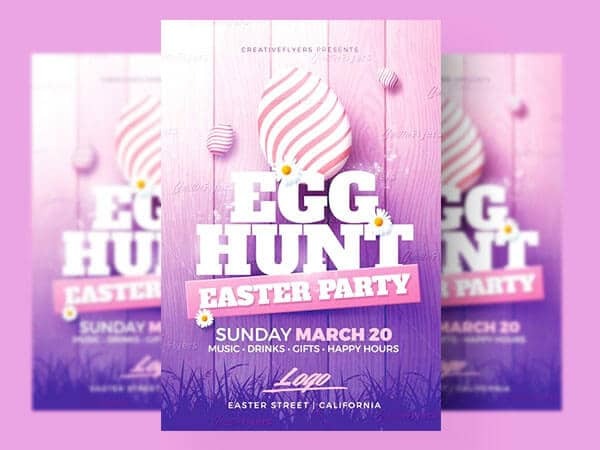 If you like this style, enjoy downloading this model Easter Party Flyer template, a first-rate design created by Creativeflyers, perfect to promote your party! All of our graphic design resources are for personal and commercial use. Here is a creative template that allows beginner and professional designers to promote their communication services. As specified in the description all our flyer templates and graphic themes will work with Adobe Photoshop. Once you have purchased this flyer template, you are free to make the desired customizations and changes according to our User License. In the same way, all the texts are easily modifiable and you can play with the colors, but also with the text and the elements to obtain unique results, to your taste. What are Psd Templates and what software to use ? Our flyer templates are downloaded as fully editable Photoshop PSD file, you can edit and customize every element of the psd design. We recommend using Adobe Photoshop CS6, but most of our templates will work with Adobe Photoshop versions CS4 and above. All our free and premium flyer templates require Adobe Photoshop. What happens after my purchase ? • After purchase and registration you will have access in an unlimited time to your purchase. • If you choose to pay by credit card, it may take up to 10 minutes to validate your payment to activate your download link. – To extract a single file or folder, double-click the compressed folder to open it. Then, drag the file or folder from the compressed folder to a new location. – To extract the entire contents of the compressed folder, right-click the folder, click Extract All, and then follow the instructions. Alternately: You may find that free tools like WinRAR or 7-zip help you unzip files with better results, especially for files that contain special characters in the file name. How to download and install a trial version of Photoshop ? Just download your first Photoshop trial application from the Adobe website. Here is our Tutorial for installing the photoshop software. Why are some models photos not included? Due to licensing restrictions, sometimes we do not include photographs of people and models in our flyer templates. We provide links for you to get your own copy of the images. Model stocks and images of the people we use are just one example for you to see what is possible when you use our flyers. We make it easy to use your own images, and for most of our models, all you need is to copy and paste your photo into the predefined placeholders. For more details on the features and use of your flyer template, see the FAQ (Frequently Asked Questions). Please feel free to direct your questions, our team will help you, Creativeflyers Support.